When it comes to Bangkok you have to give that city a chance. I spoke to so many people wo absolutely hated that place, found it too busy and dirty. 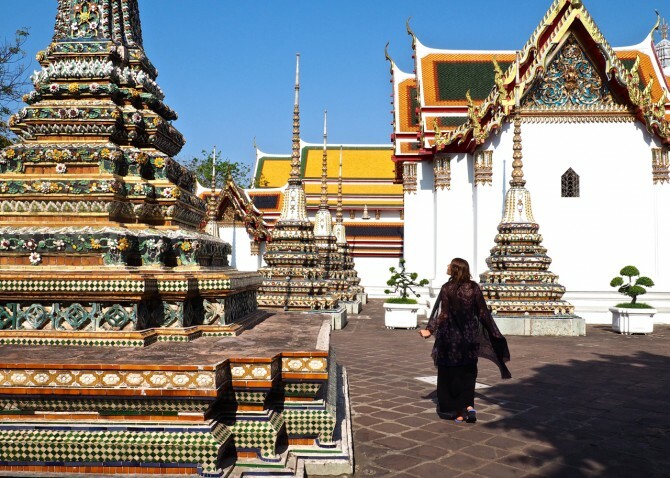 I believe that those people haven’t taken the time to fully explore Bangkok and see its charming sides: the lush parks, markets, interesting neighborhoods and beautiful architecture. 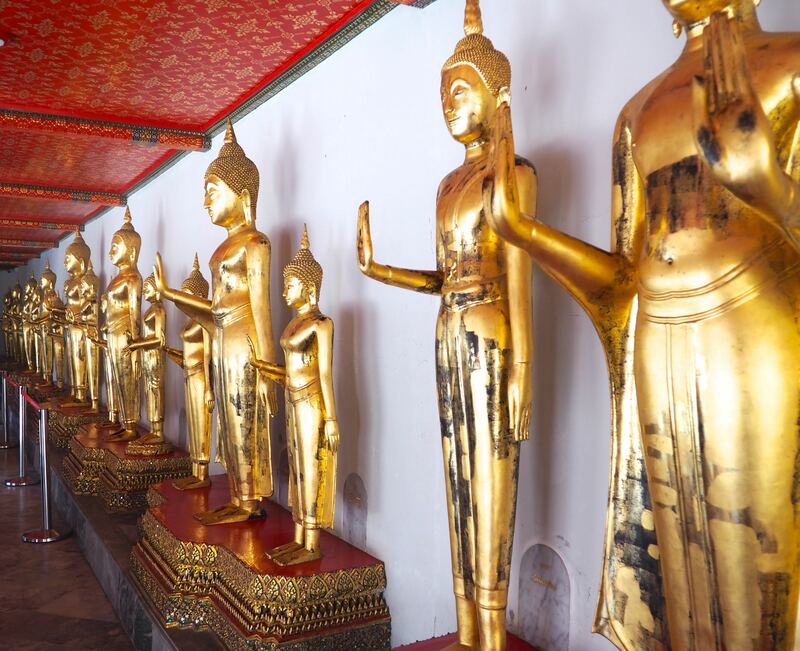 Whether you are traveling to Bangkok for the first time and wondering what to do in Bangkok or you want to get some inspiration what else to do in Bangkok beyond the usual, this article is for you. 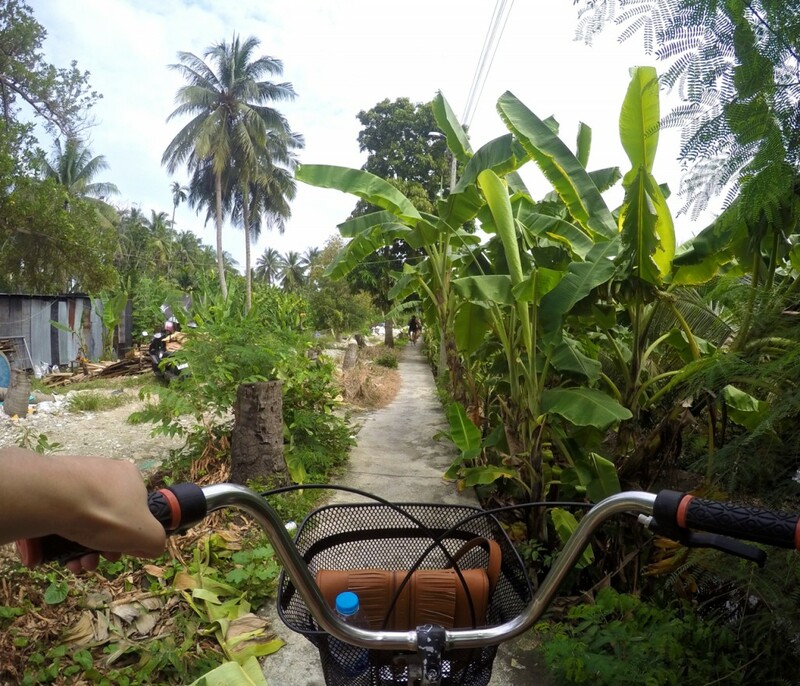 Yes, you read it correctly… One of my recommendations for Bangkok is to go on a bike tour. It might sound crazy to go cycling in this busy metropolis, but what a lot of people don’t know is that the city has different facades. You can find lush parks, hidden temples, interesting local areas and believe it or not you can also find peace and quietness in Bangkok. 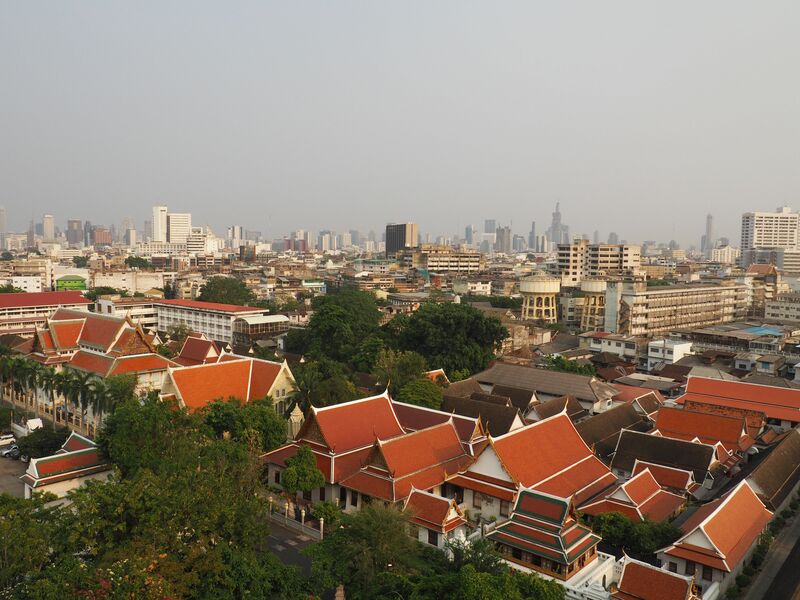 A bike tour of Bangkok will take you to all those spots and will show you a different side of the city you might have not experienced otherwise. There are multiple companies that offer bike tours in Bangkok. 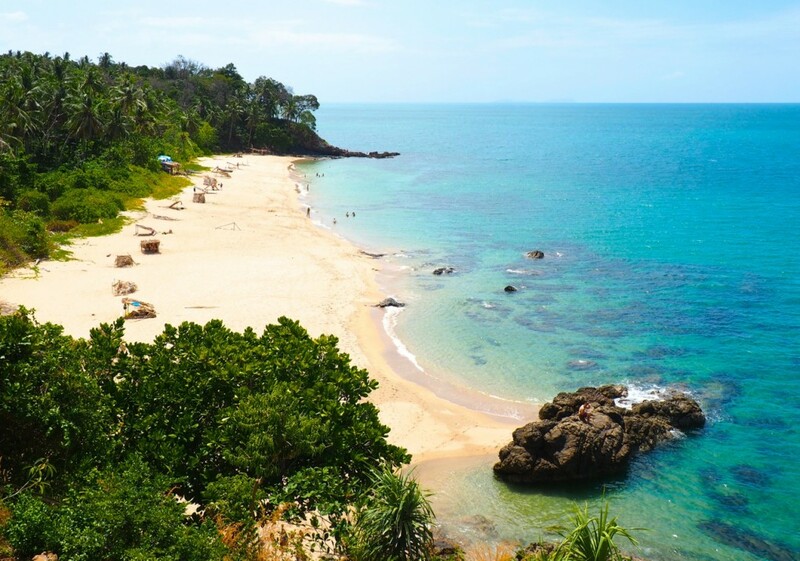 One company that I can personally recommend is „Co van Kessel Bangkok Tours“– that was founded by a Dutchman 30 years ago and pioneered bicycle tours in Bangkok. The classical bicycle tour takes 3 hours and explores the backstreets of Chinatown and the charming local area of Thonburi. If you have a bit more time at hand the 5/hour bicycle/boat-tour takes you through Bangkok on land and water and will show you the best of Bangkok. This is the tour that I did and enjoyed a lot. We cycled through Chinatown, visited a temple and a local market where we tasted some fruit, loaded our bikes on a boat to see the “Venice of the East” and ended our tour with a delicious Thai meal before heading back. This tour really takes you off the beaten track and shows you a beautiful and charming side of Bangkok away from the hustle and bustle. For hardy adventures there is also a 9 hour bike-boat-train tour. What Central Park is to New York, that is Lumpini Park to Bangkok. The park is an oasis in the heart of the city and the perfect place to escape from all the noise and the busy streets for awhile. 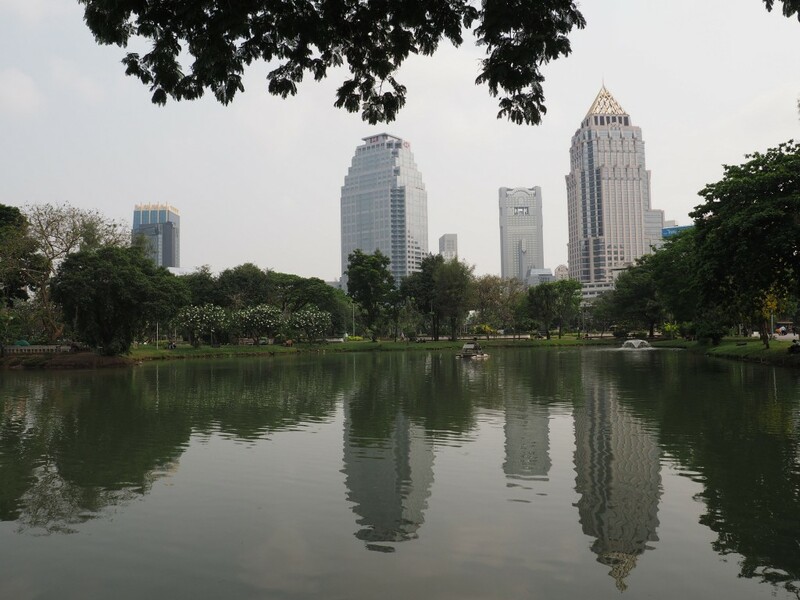 The park offers shade and fresh air and is no wonder why it is called the green lung of Bangkok from time to time. The park offers recreation for all ages. Especially in the early morning and at dusk you will see people working out or going for a jog or stroll, on the weekends the park is full with families having a picknick or playing games. In the middle of a park is a lake where you can hire rowing or paddle boats. If you feel like grabbing a bite, there are a lot of food stalls situated in and around the park. The park can be reached by MRT, just get out at Silom or Lumpini station. Grab a travel buddy and get a tuk tuk driver to take you around the sights. Discuss the price, length of tour and the sights you want to visit with your took took driver prior to the tour so you are at the same page and don’t forget to haggle about the price. I remember that we payed around 10 Euros for a whole afternoon of sightseeing. There are plenty of things to see in Bangkok. 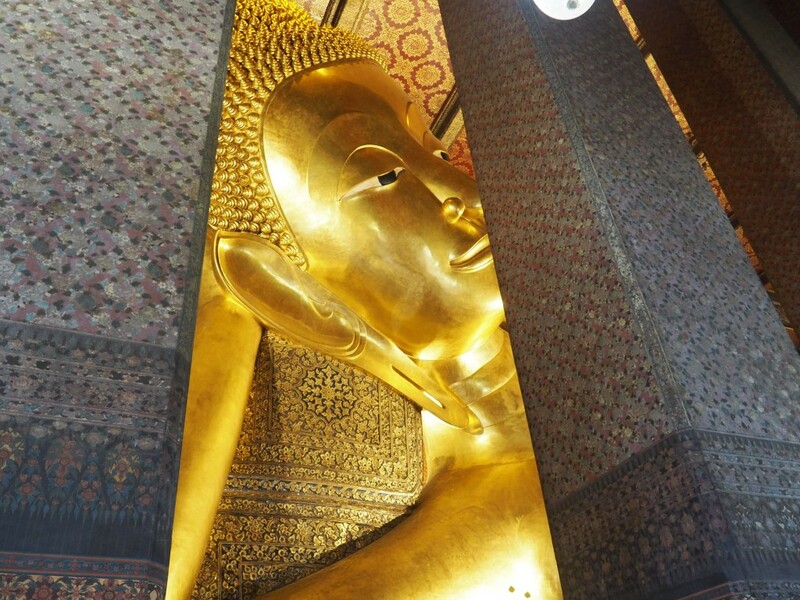 You definitely want to include Wat Pho– famous for the golden reclining Buddha and harbors a fascinating collection of murals and sculptures, the Grand Palace& Wat Phra Kaew with its beautiful architecture and details and Wat Saket also know as the Golden Mountain that offers a great view of Old Bangkok from the terrace on top. 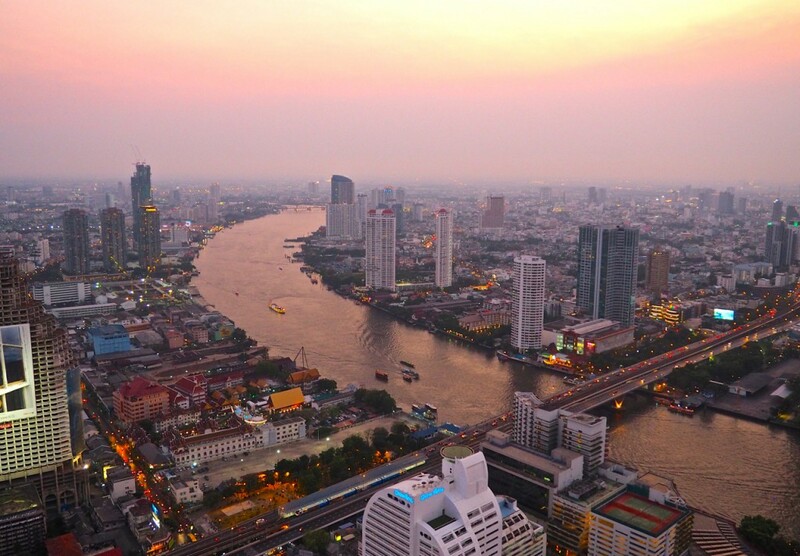 Bangkok is a great place for unique shopping experiences and one of them is a visit to one of the many floating markets that date back to the time when Bangkok was full of waterways and was the “Venice of the East”. 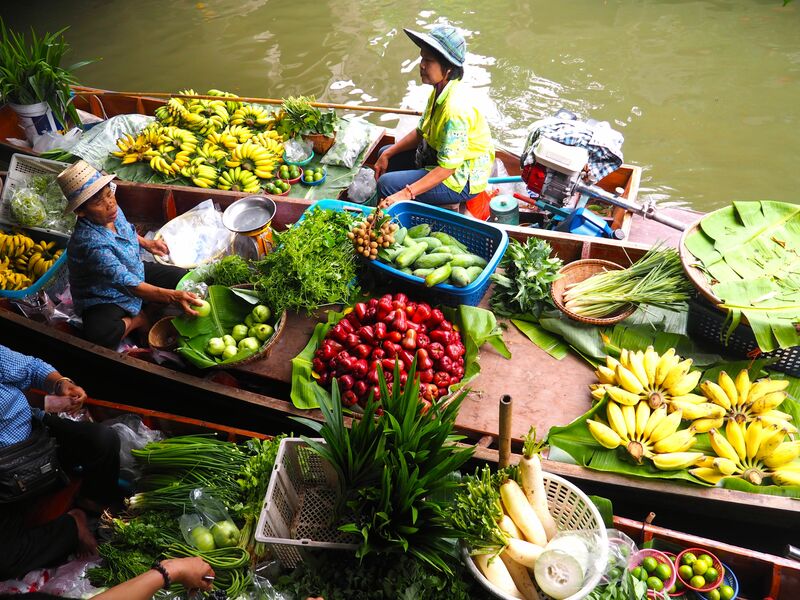 There are many floating markets to choose from and they all differ in size and atmosphere. 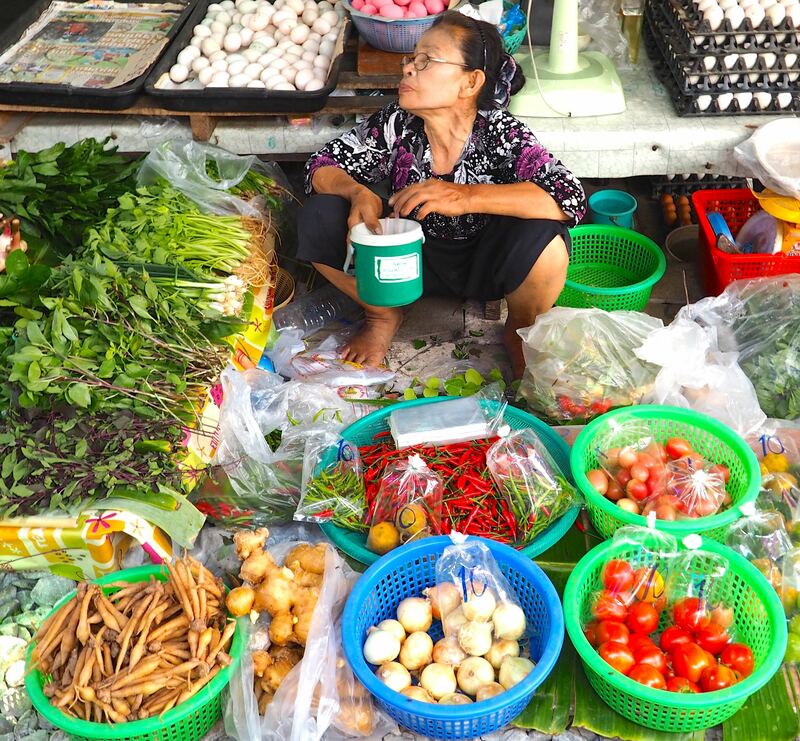 Among the most popular ones is Damnoen Saduak Floating Market, which is around 100 km out of town. On my last visit to Bangkok we decided to visit the market. It takes around 1.5 hours by taxi or 2 hours by bus and we left around 5 am to experience the market without the crowds. There are many stalls and boats that sell food and souvenirs, but it was really targeted towards tourists and missing the authentic feel. Personally I wouldn’t recommend the market, a great alternative in my eyes is Khlong Lat Mayom Floating Marke-even though it is a fairly new addition to the floating markets in Bangkok it feels way more authentic as it is mainly visited by locals. Here you will find everything: fresh fruit and vegetables, clothes, handcrafts and you can try many different dishes that are directly prepared on the boat or on the market along the water. Bangkok is famous for its rooftop bars and a great way to end an exciting day is to have a cocktail while overlooking the skyline of Bangkok. Come for sunset and watch the city light up when it gets dark. The most known rooftop bar is probably the Sirocco Sky Bar at Lebua State Tower that was featured in the Hangover 2 movie and has a great view of the river and the city. Be aware that the dress code is smart-casual and they tend to enforce it: Flip flops and shorts are a no go. Drinks are rather on the expensive side with 2000 Baht per drink. 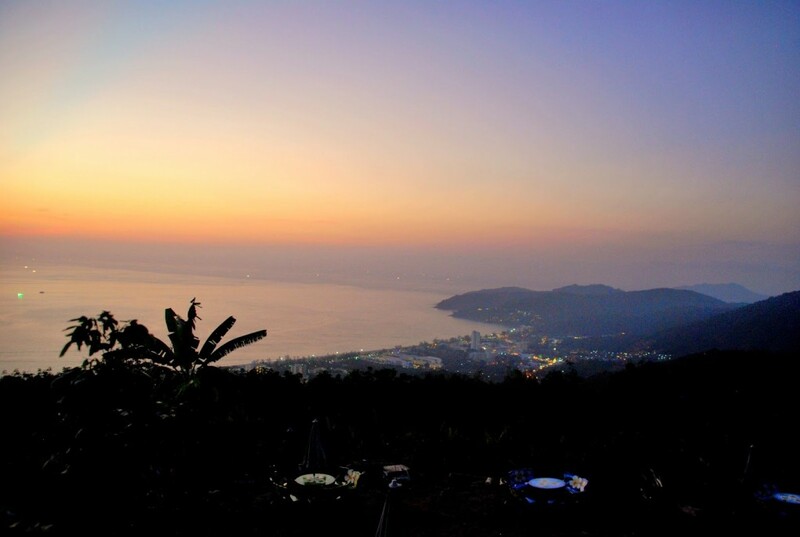 Another equally popular alternative is the Vertigo& Moon Bar at the Banyan Tree Hotel. Great alternatives without the crowds are Red Sky Bar at the Centara Grand (offers a great view of the skyline and usually less busy so you will be able to get a table), Cielo Sky Bar (affordable prices, very charming, faces the sunset), Octave Rooftop Lounge and Bar at Mariott Hotel Sukhumvit (stunning 360 degree views, happy hour from 5-7 pm with half price on their signature cocktails). Along the Chao Phraya River, the main river that runs through Bangkok, are several stops where you can hop on the public ferry. The tickets are cheap and it is an easy and comfortable way to get around Bangkok. 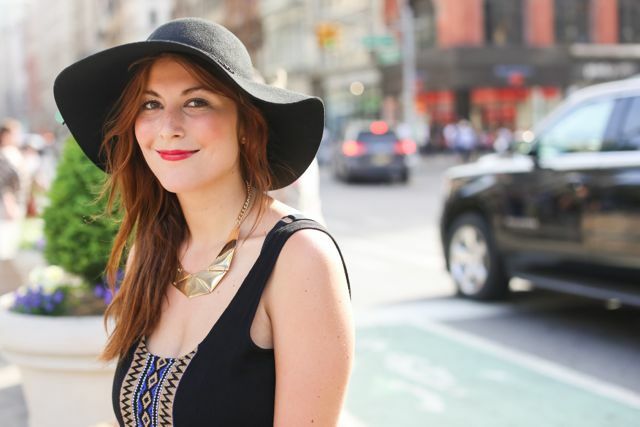 It is a comfortable and fun way to see the city. 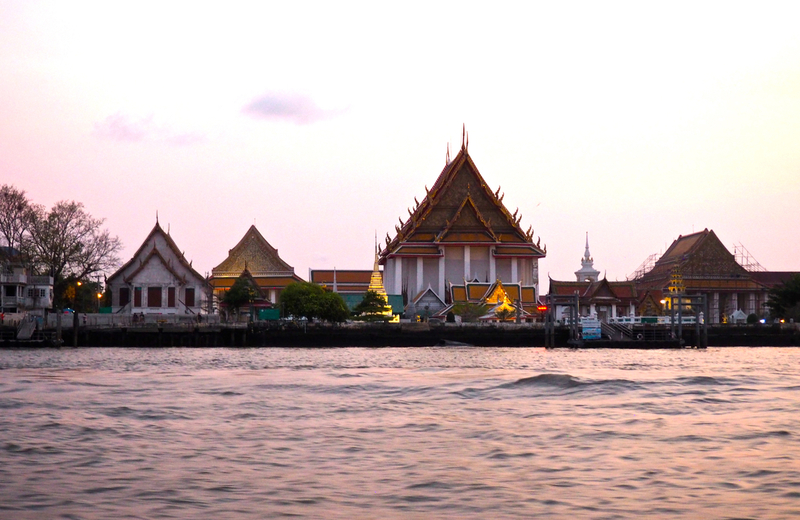 The ferry stops at quite a few attractions like Wat Arun and the Grand Palace and therefore is a great alternative to taxis and tuk tucks, especially during rush hour. 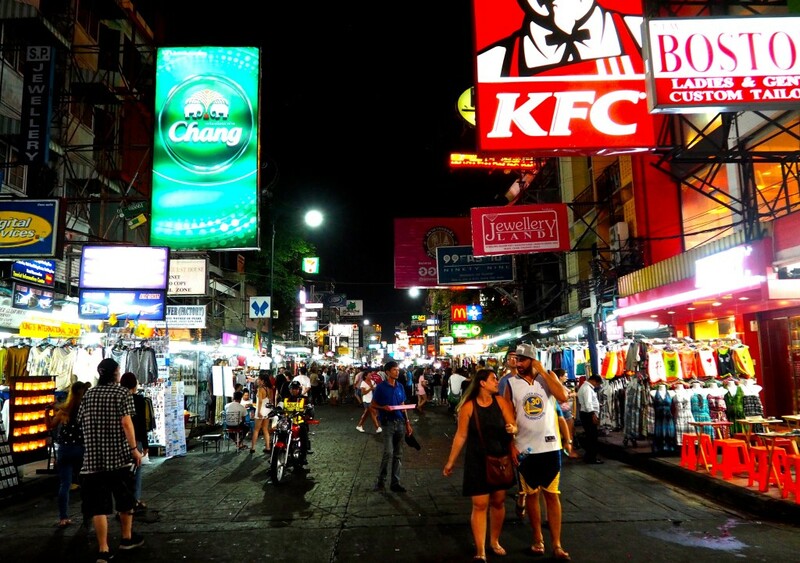 Khao San Road could be considered the backpacker capital. Nowhere else do so many travelers from countries all around the world come together. Along the street are many bars, international restaurants, food stalls and shops. If you are looking for a fun night out or want to meet other people this is the place to go to. I personally prefer Soi Rambuttri, which is a bit quieter. Bangkok is a paradise for shopaholics. Here you will find it all: big shopping malls and unique markets. 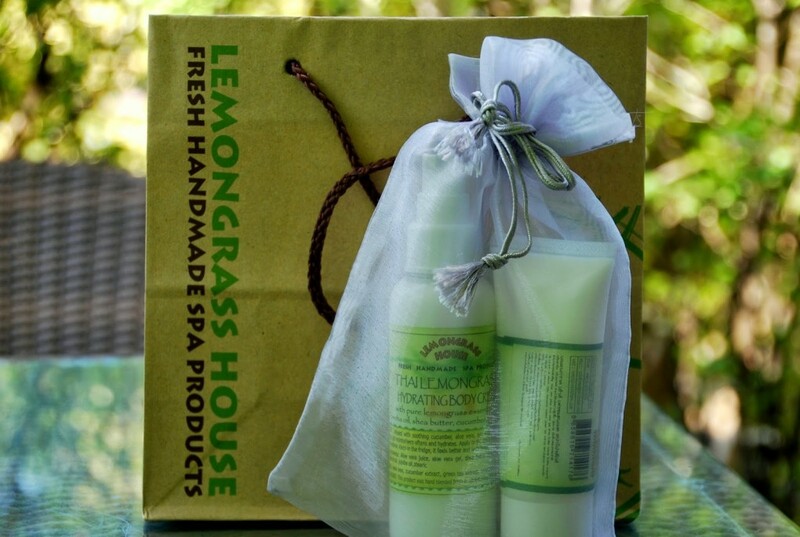 Especially if you are planning on traveling further in South East Asia, this is the place where you should get everything you still need. Start off by heading to the malls to understand a part of Bangkok culture. Malls here are more like social hubs where people come to shop, eat and play. At the MBK shopping centre you will find a wide range of cheap electronics and clothes, Paragon and Emporium are more upscale shopping and Terminal 21 I can recommend for their delicious food court. If you happen to be in Bangkok on a weekend, don’t miss out on the popular Chatuchak Weekend Market. It’s considered one of the worlds biggest markets with over 15.000 booths selling goods.Vendors come from all around Thailand to sell a wide range of products, goods and food. 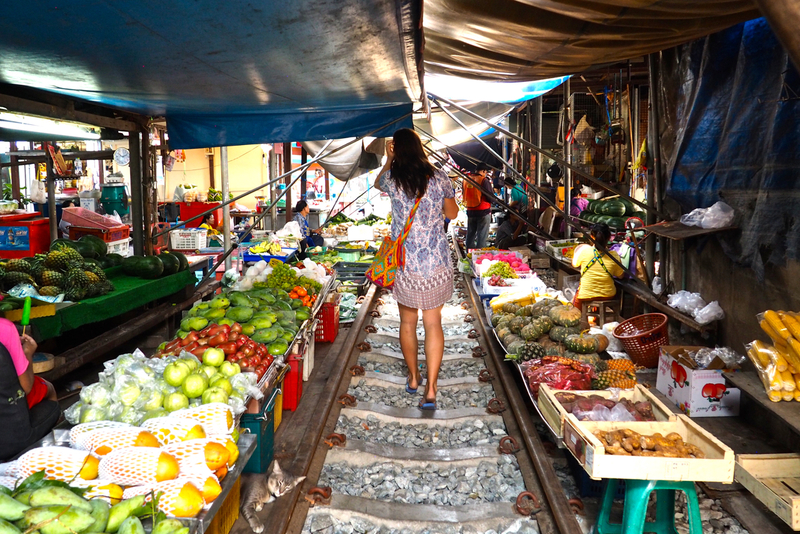 The most unique market that I found would be the Maeklong Railway Market one hour out of Bangkok. Maybe you have heard of this market before or seen a documentary about it on TV. The market stands out because it has a train running through the middle of it multiple times a day. Before the train arrives, vendors move their goods away from the train tracks and once it has past they continue selling them again. It is a pretty unique sight and a great photo motive. If you want to learn more about Thai culture, there is a wide range of great museums worth checking out. The National Museum features a lot of interesting musical instruments and impressive wooden carvings. The best time to go would be on Wednesdays and Thursdays at 9.30 am when they have a tour in English language. Another nice place to visit is the Jim Thompson House- a beautiful villa in the Thai style surrounded by a lush garden. Here you can learn about Jim who was an American spy and silk merchant, the silk industry and why Thai houses are designed the way they are. If I only could eat one type of cuisine for the rest of my life it would be Thai cuisine. For me it is the perfect combination off all flavors using mainly fresh ingredients. If yo are interested in learning about the food and tasting many delicious things, I would suggest you to go on a food tour or learn how to prepare some of the dishes yourself by spending an afternoon taking a cooking class. 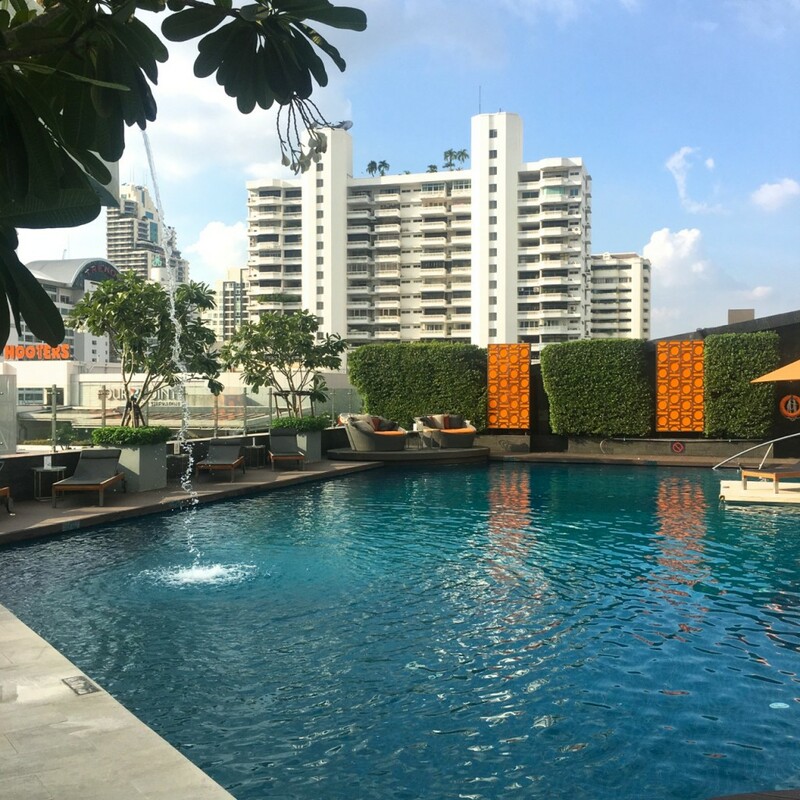 Looking for a hotel for your stay in Bangkok? A comfortable hotel with a convenient location close to the main attractions and public transport is the Westin Grande Sukhumvit Bangkok. Apart from the location that makes it perfect for a city or business trip I enjoyed the heavenly bed, big breakfast buffet and the pool. Read my full review here.